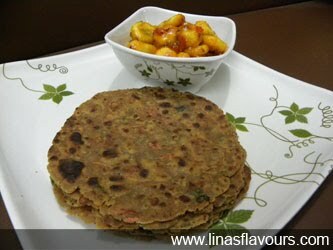 Take a bowl, add rajghara flour, grated carrot, green chillies, coriander leaves, salt, 2 teaspoon oil and knead dough. Keep it aside for 15-20 minutes. If you don’t have time you can do it immediately also. Make small balls. Take a ball, roll into the flour and roll the paratha of about 3 inches diameter. Take a tawa/griddle and cook it on both the sides, smearing it with oil on a medium flame. Make all the parathas this way. Serve it hot with banana vegetable, curry or raita.